The field is, far from being exhausted, just beginning to be explored. 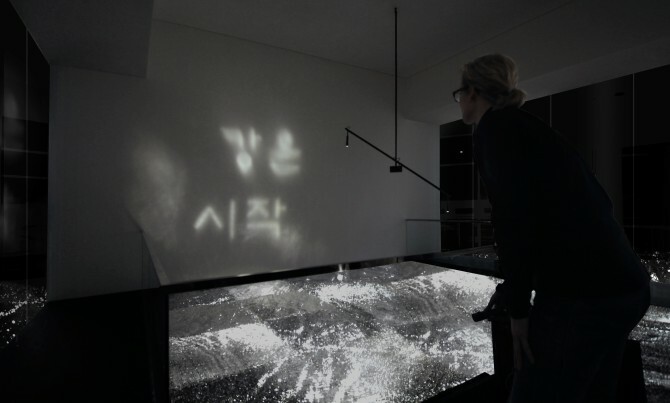 The installations River is…, Mobility and Anamorphic Mirror demonstrate the potential of computational reflectives for spatial communication and as an artistic medium. 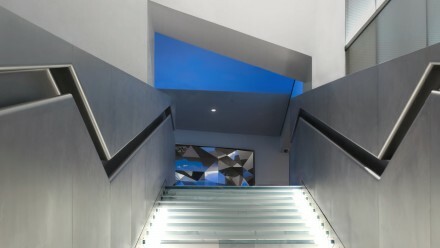 The exploration of this medium led to in-house developed software that can create individual reflective installations. With the design of our first kinetic sculptures, our interest in combining kinetics with light and reflection increased. Resonance and Infinite Cube were kinetic sculptures that generated abstract reflections, but with Mobility (all 2010) we took a decisive step further. The sculpture is concretely narrative: it was computationally designed so that a matrix of one hundred revolving mirrors casts a complex, abstract, choreographed sequence of moving lights, which periodically coalesce into a Chinese character denoting movement and action, onto a wall opposite. The final design was preceded by countless computational studies that played through variations in the number, arrangement and orientation of the mirrors and the prosthetic hands holding them. 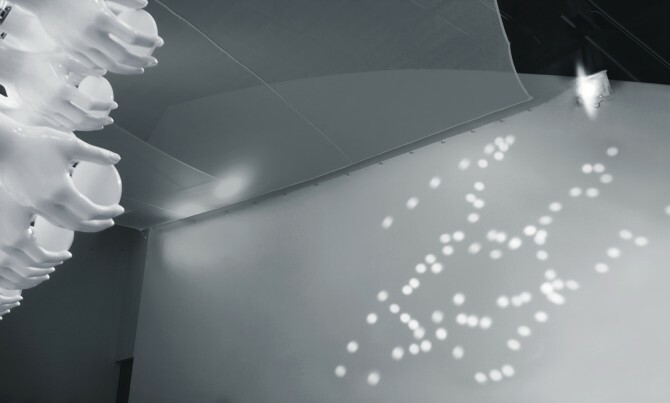 The computational design process simplified the development of the installation and resulted in a solution in which two axes of mirror movement were completely abandoned. The mirrors instead rotate around their central axis only. Additionally, each mirror was attached at a slightly different angle. We subsequently made the decision to build a matrix that was limited to communicating only the content specifically developed for the location rather than a system with a wider spectrum of possibilities for presentation. 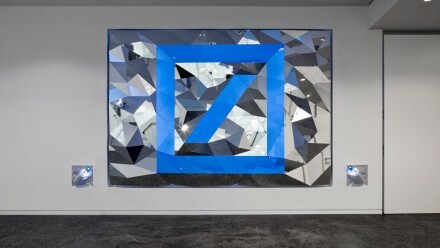 In 2010, ART+COM was commissioned to create an artwork that could guide visitors to Deutsche Bank’s Frankfurt headquarters from the foyer up to the first floor. Spatial limitations combined with clear sightlines from different perspectives meant an easy decision to develop a visual work that changed with the movement of viewers through the space. The fist concept was based on a refractive glass panel, through which the geometric logo — a deconstructed blue pattern on the wall behind — would have been visible only from a specific viewing angle. The idea was ultimately abandoned because the refractive glass surface would have needed significant depth to present the symbol at a reasonable size in the space, which would have been complicated and expensive to produce. 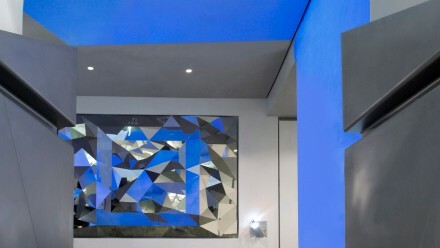 Eventually the Anamorphic Mirror (2011) concept, whose deeply facetted mirror surface reflects blue light directed onto the opposite wall, emerged as the strongest idea. 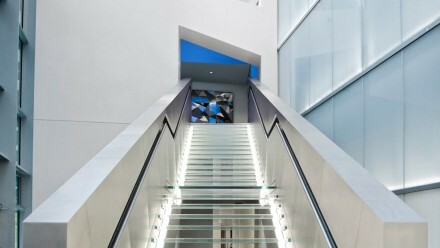 Approaching the artwork, every step reveals a new configuration of chaotic blue reflections. The blue logo is visible only from the sweet spot on the stairs. 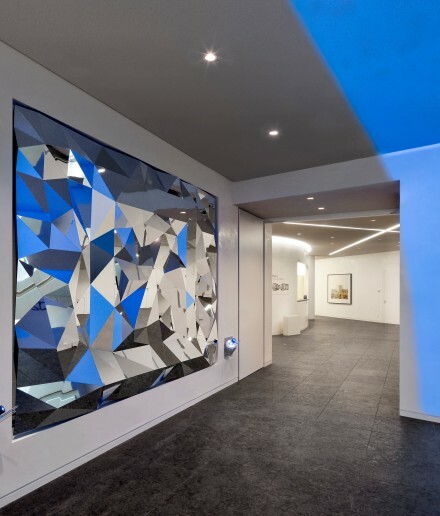 On the way to this solution another relatively more complex design, which included the precise positioning of blue colour fields painted on the surrounding walls and reflected by the mirror facets, was dismissed. A simpler and more effective solution lay in projecting blue light onto the opposite wall. The mirror facets were computationally aligned so that the logo becomes visible from a particular point on the upper landing. As visitors climb the stairs, a new image forms with every step, so that with movement a quasi-filmic narrative evolves, which finally coalesces into the logo. 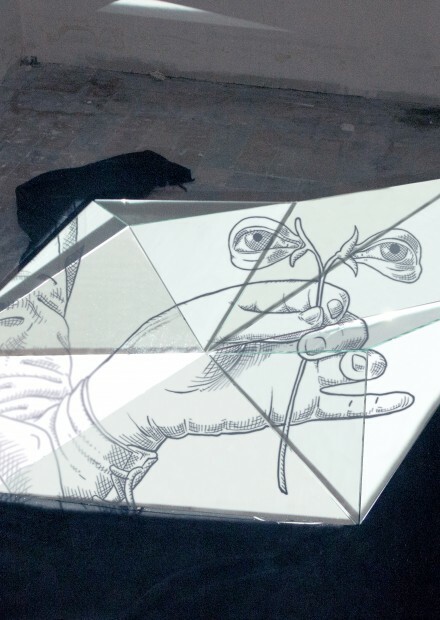 Out of the Anamorphic Mirror concept, a temporary installation, Les Eclats Dans L’Oeil (2013) was developed for an exhibition at Les Bains in Paris. Invited to realise a site-specific installation within a very short timeframe, we experimented with the prototype built for Anamorphic Mirror, a facetted mirror object. 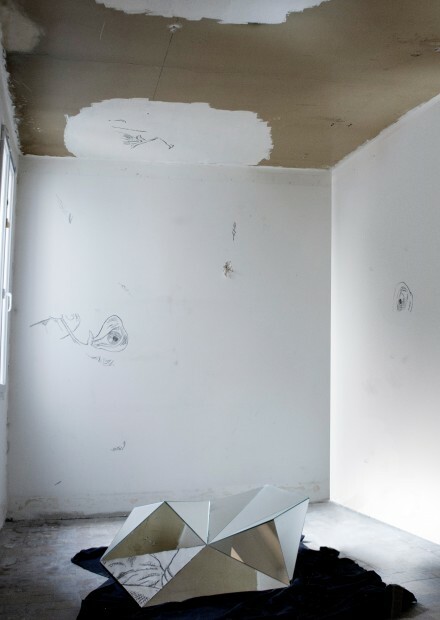 The resulting installation featured a deconstructed drawing in segments on the walls that, when seen from the sweet spot, was synthesized in the mirror object. In contrast to Anamorphic Mirror, the existing mirror object dictated the arrangement of image segments around the room. There was no need for calculations; a projection of the image from the sweet spot was enough to determine the arrangement. For Anamorphic Mirror however, the forms and angles of the individual mirror facets had to be computationally calculated based on the presentation of the logo and the parameters of the space. Subsequently, we developed a software package that enables us to create facetted mirror sculptures for complex spaces and multiple synthesised images and sweet spots. When we created the installation River is… (2012), rapid manufacturing was sufficiently well-developed and technically manageable that it made economic sense for the manufacture of, for example, complex surfaces. 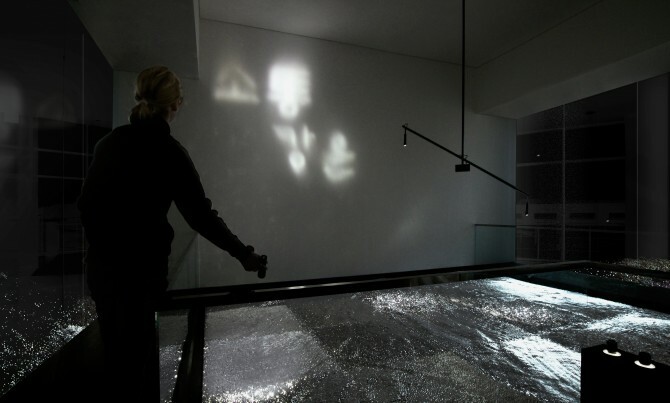 The conceptual starting point for River is… was caustics, the principle of light refraction on water surfaces. It was a context-specific idea, but it also offered us the possibility of working with reflection again. 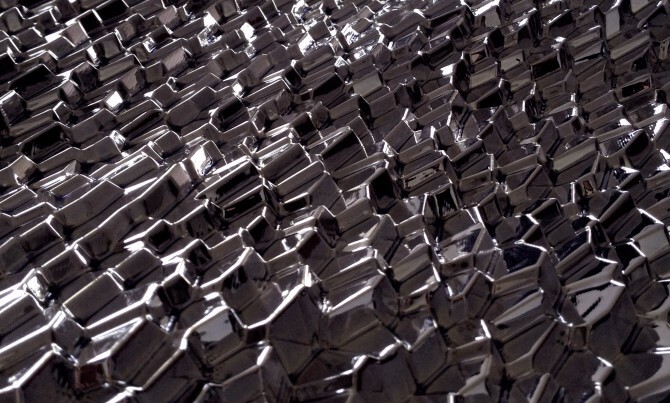 A 23 square metre, chrome-plated and highly complex facetted surface represents an abstract snapshot of a river. 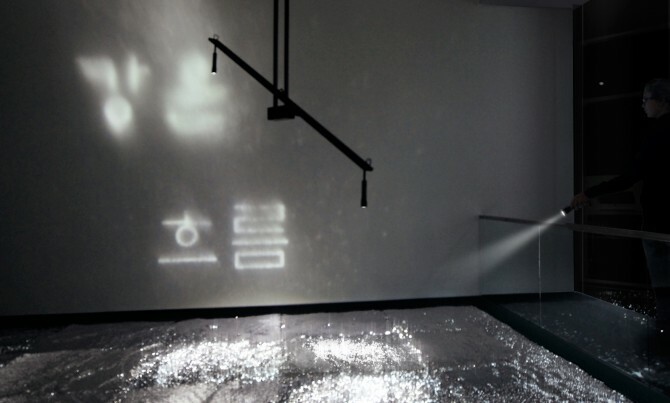 Encoded into the surface were Korean characters, readable only as a reflection on the wall with the help of directed light. Visitors are invited to explore the surface with torches to find the ‘coded’ places that reflect the characters onto the walls. 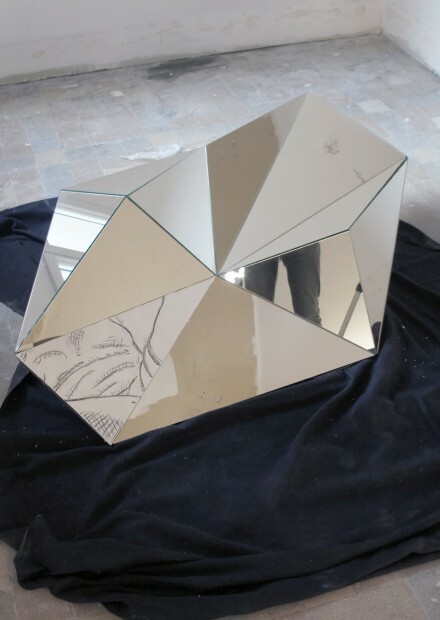 The first design phase prototypes provided information about how high the resolution of the mirror surface needed to be to reflect the forms of the characters. 3D renderings followed, and finally the computational design and the bevelling of the facetted base plates that were coated with silver.